I created this block for a bee I was part of on flickr. It is the block interpretation of a full quilt designed by Violet Craft to showcase her Madrona Road fabric line. Many thanks to Katy at I’m a Ginger Monkey for the use of her picture (below – showing the quilt designed by Violet Craft). My bee mates asked for a tutorial, so I wrote it up here. This only makes a single 12″ finished block. If you want to make the gorgeous quilt above, you can find Violet Craft’s pattern on her site here. This makes a 12.5″ x 12.5″ unfinished block. All seams are 1/4″ and while I press my seams open, you’re welcome to press them however you see fit. 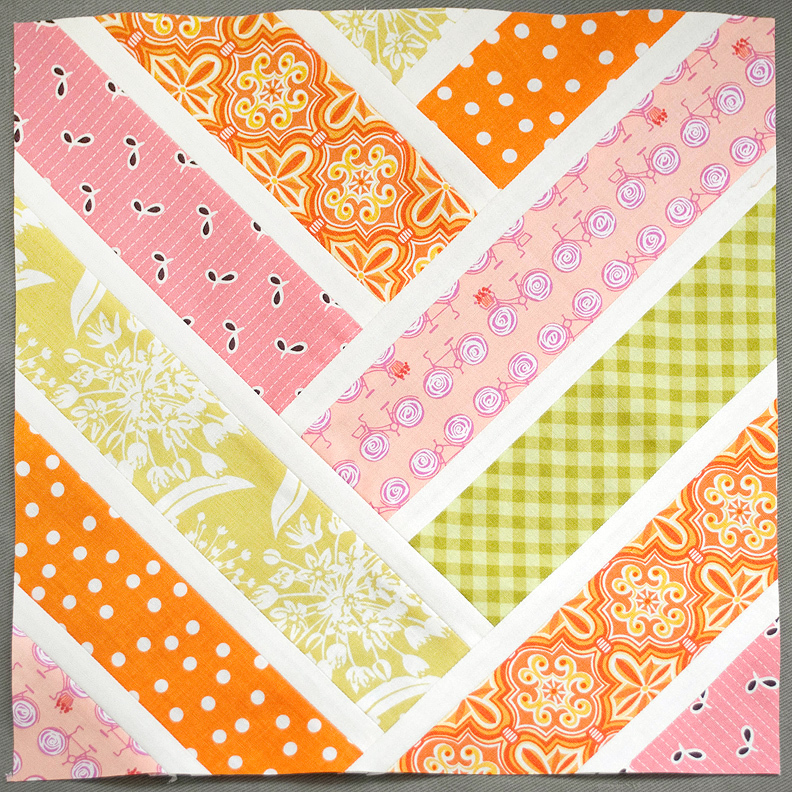 You will need: 6 – 2.5″ x 18″ strips of fabric 3 – 1″ x WoF strips of sashing For the block shown in the tutorial, Gillian had asked for pinks, oranges, and chartreuse/lime green on an off-white. I generally choose two fabrics for each color. Pick your fabrics. 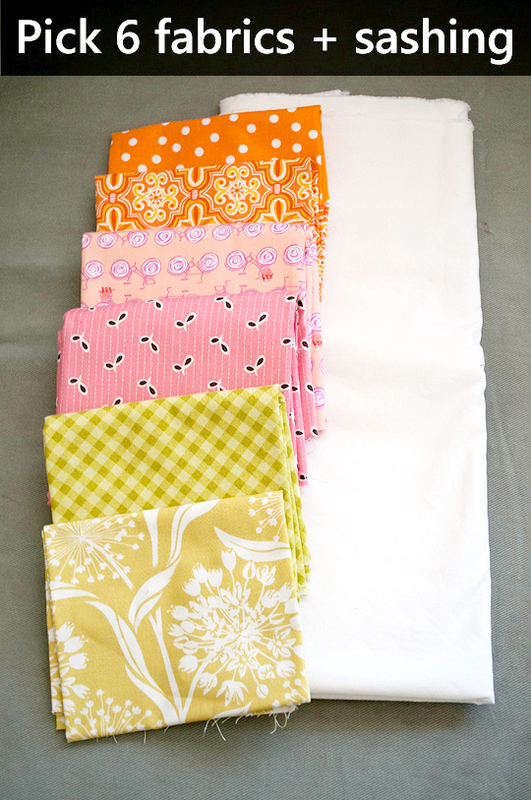 Six feature fabrics and one neutral for the sashing. 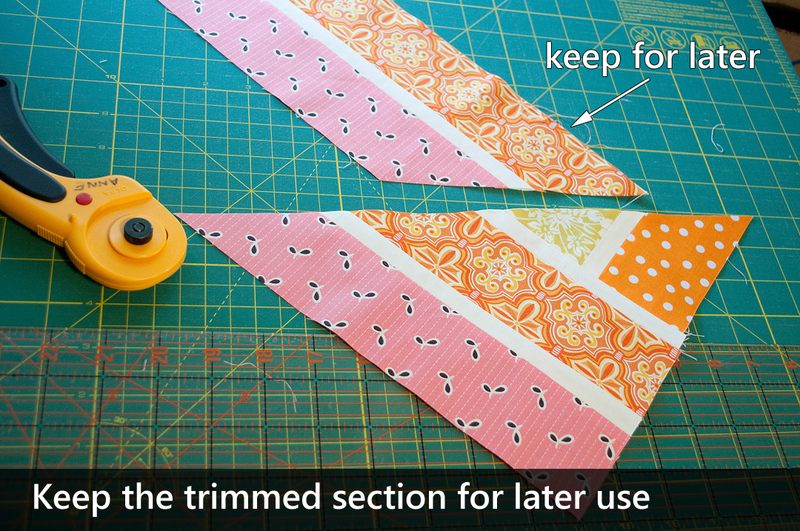 Once your fabrics are chosen, you will need to cut one 2.5″ strip from each of the feature fabrics. These strips should be at least 18″ long (short edge of a fat quarter). Some of mine are longer because I needed to cut from the long edge of a fat quarter. This is fine, but will end up with more scrap waste at the end. 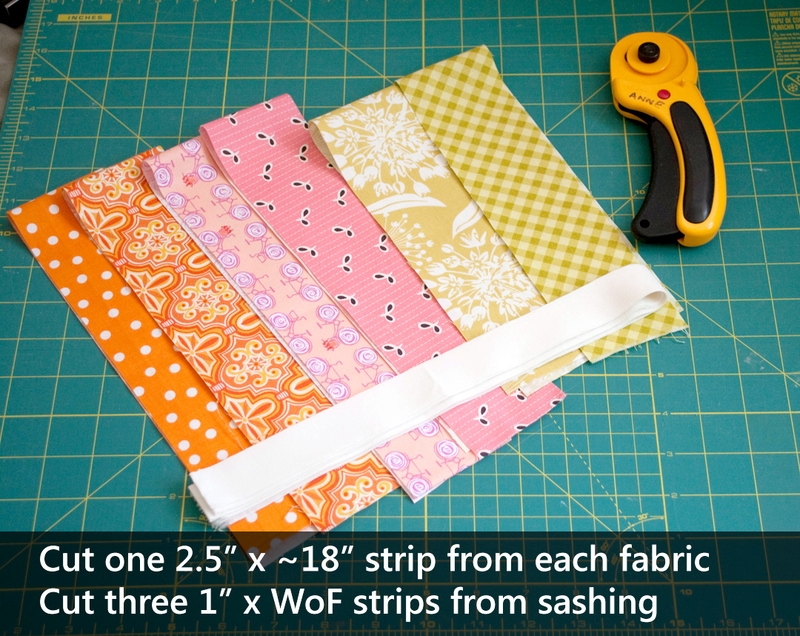 Cut three 1″ x WoF (width of fabric) strips from your sashing fabric. 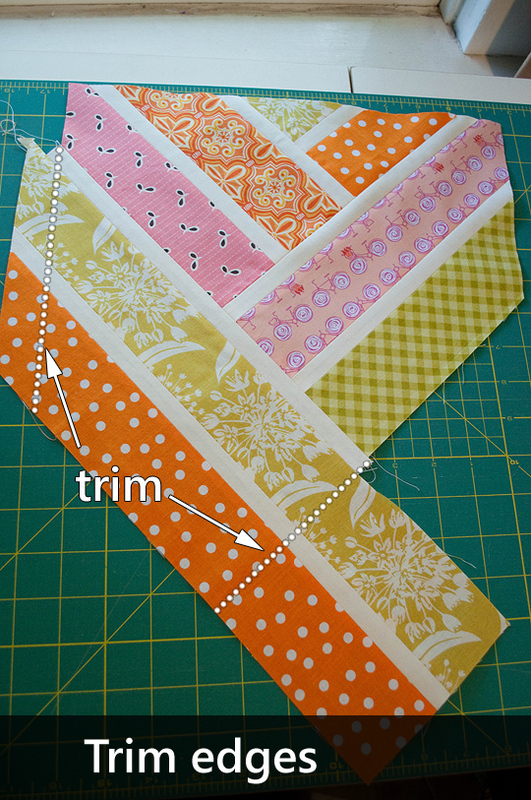 If you are using a fat quarter, use the long edge and cut six strips instead of three. 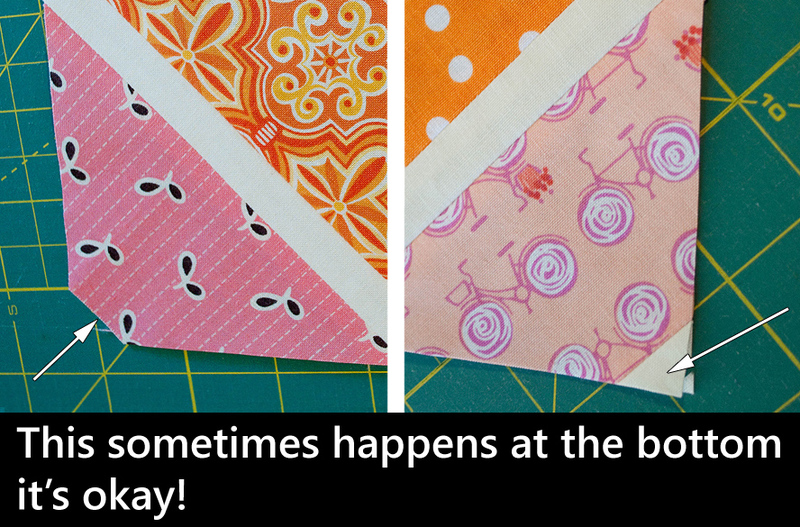 Cut one 2.5″ x 18″ strip from each of your feature fabrics, and cut three 1″ x WoF (44″) strips from your sashing fabric. 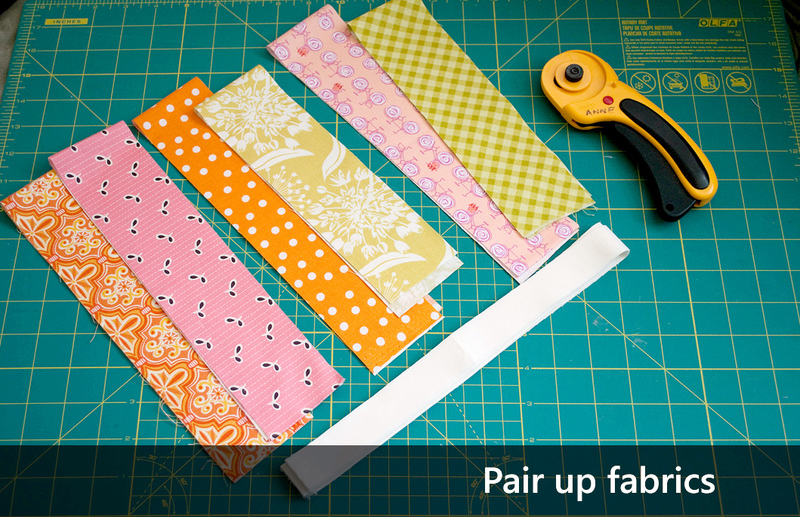 The strips will be used in pairs, so find pairings that you like. I tried to do each combination of colors, so one set was pink and orange, one set was pink and green, and the last set was orange and green. Pair up the 2.5″ strips. 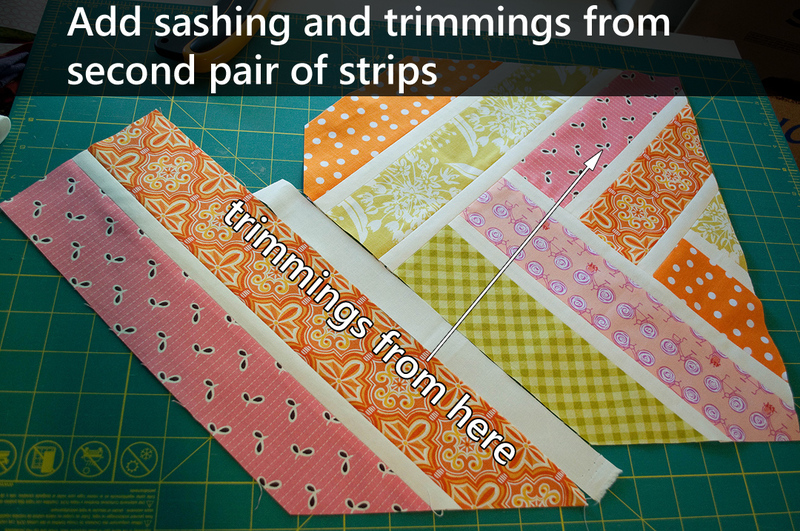 Sew each pair of strips with a strip of sashing in the middle. 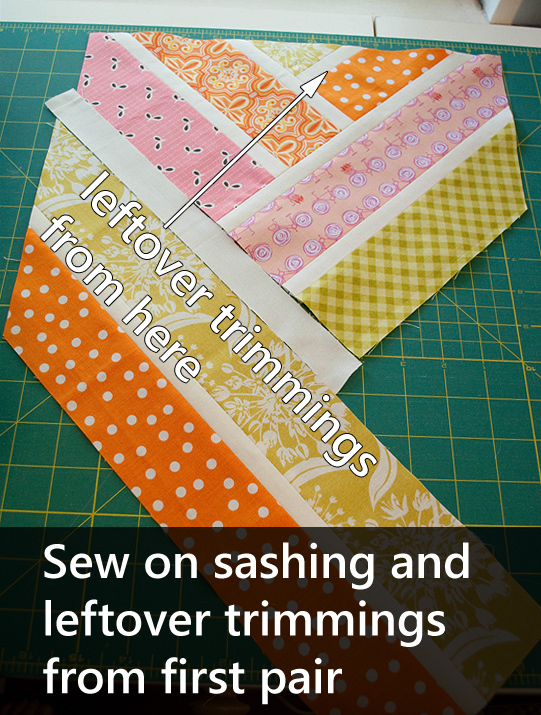 If you are using mismatched lengths of strips, start by sewing the sashing to the shorter strip, so that you use less of your sashing material. 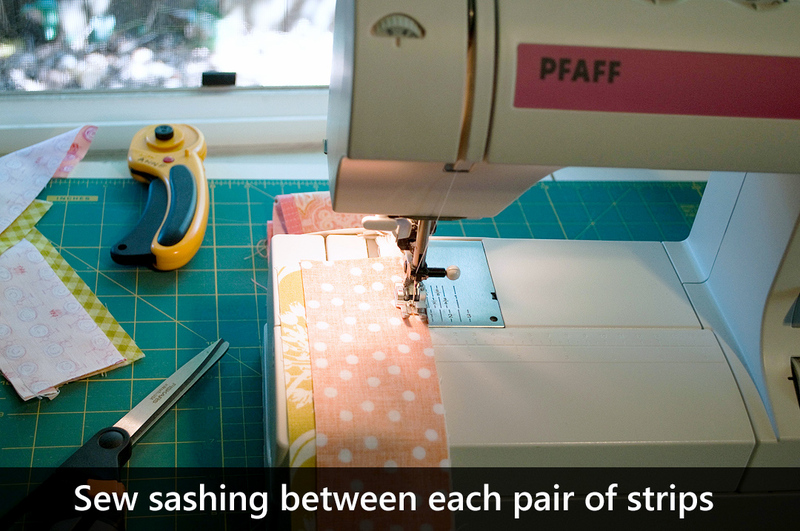 Sew each pair of strips with a strip of sashing between them. Press and trim the ends. 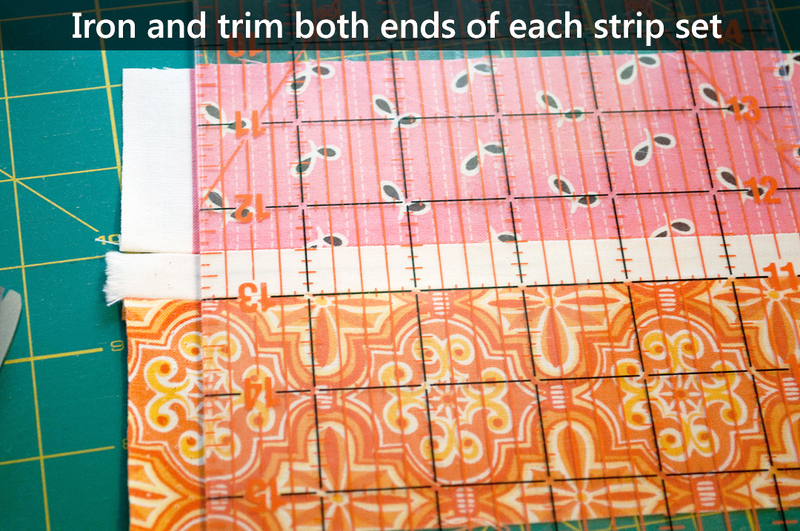 Trim both ends of each pair of strips. Now comes a design decision. 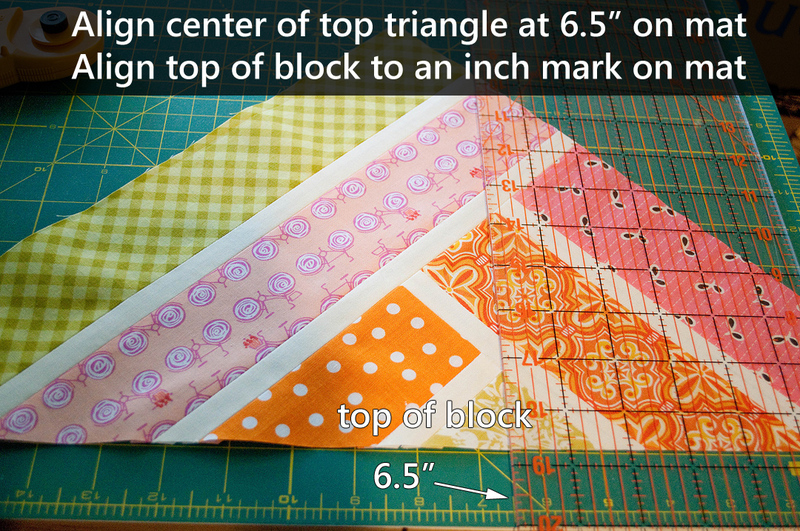 Pick which fabric you want as the top triangle of the block. If you’ve paired up the fabrics with each color combination, the fabric color at the top will be the color that is shown the least in the block. So if you want a pop of one color, that’s a good color to choose. In this case, I knew I wanted the green to be the pop of color, so I chose the green to be the top fabric. With your pop color fabric at the top of the pair, sew a piece of sashing to the left end, leaving ~1″ extra beyond the top print. This is just for trimming, we’re not going to do anything fancy with it. 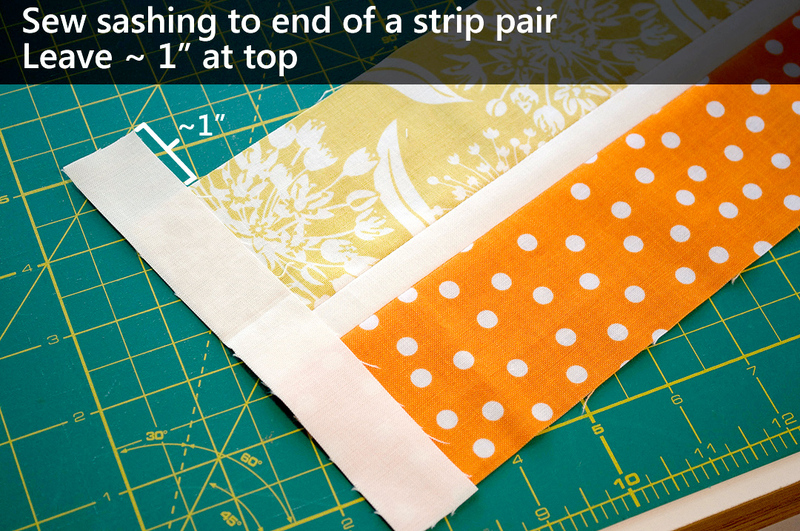 Add sashing to the left end of the pair of strips, leaving ~1″ at the top end. 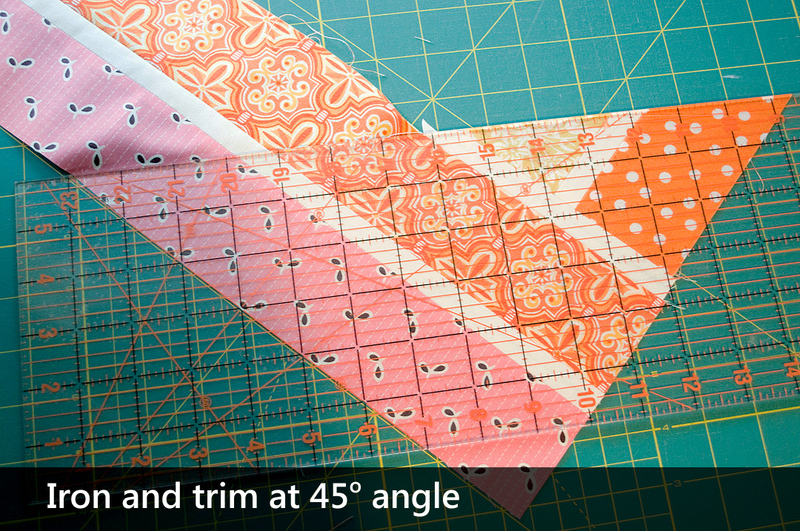 Press and trim, lining the sashing up at the 45 degree angle mark on your ruler (or mat) and cutting across the top. That should leave your chosen fabric as a triangle which will be the top of your block. Keep the trimmings from this, we will use it later. 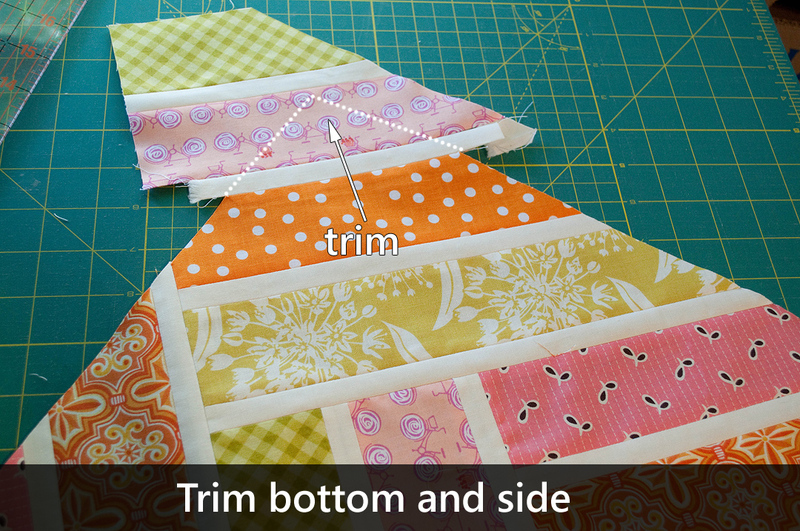 Keep the trimmed strip pair for later. 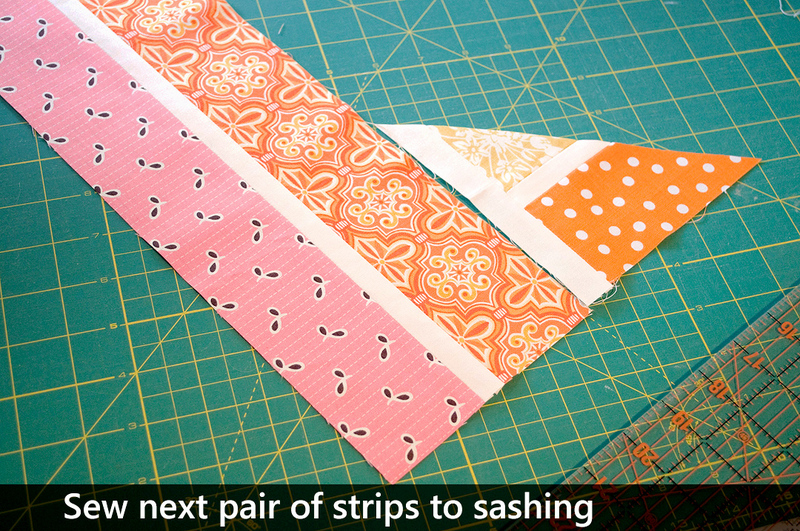 Next, pick the next pair of strips and sew them to the sashing. For my blocks, I generally matched colors because I liked the way that looked. So for instance, the orange is the bottom color currently, so I would choose the other pair of strips that included orange, and make that my top color, as shown in the picture. This isn’t required, do what looks good to you! 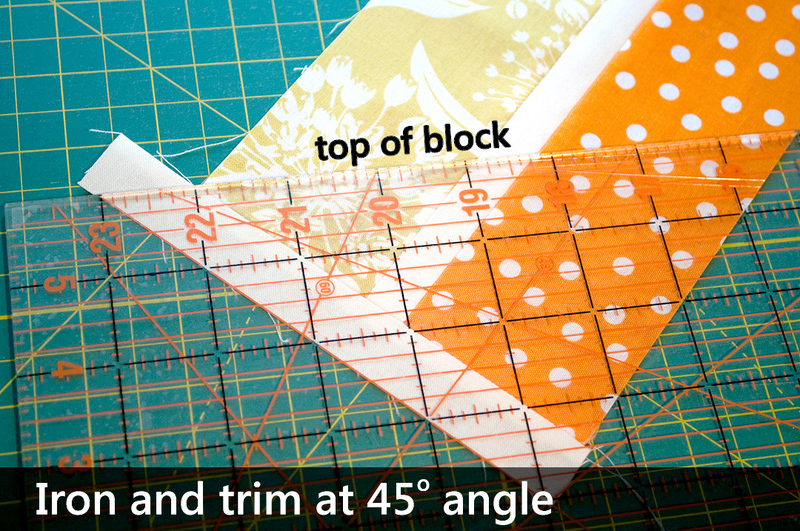 Press and trim the top of the block, lining up to the 45 degree angle mark on your ruler. Once again, keep the part you just trimmed off, we’ll be using it later. Keep the part you just trimmed off. Now trim the right side, which is where we’ll be adding sashing next. 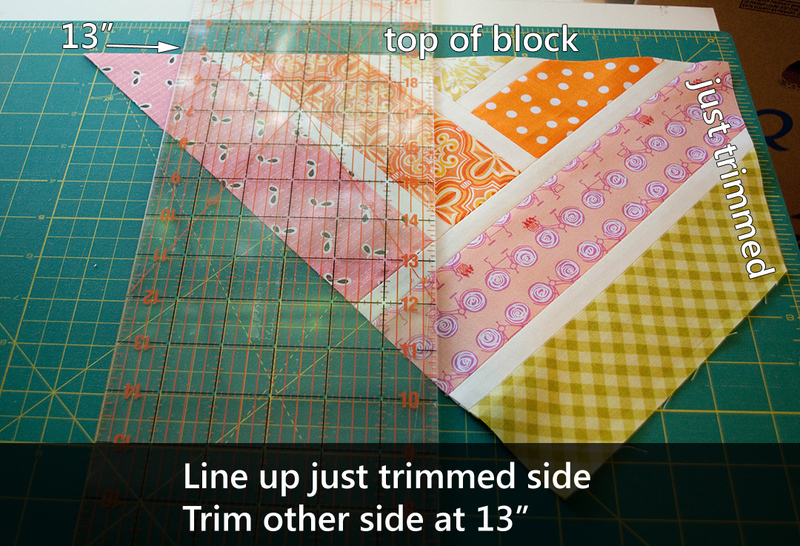 To do this, line up the top of the block to the 45 degree mark, and trim off the uneven bits from the pair of strips you just added. 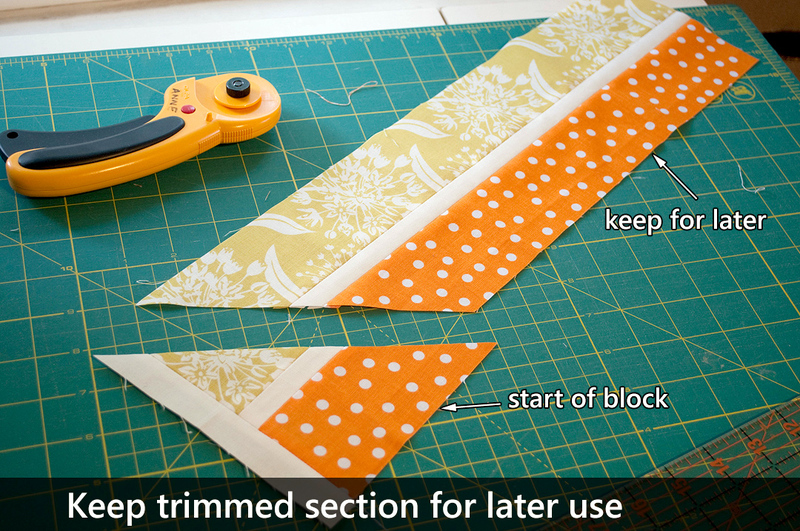 Trim the right side of the block to prepare for more sashing. Next, add a strip of sashing to the part you just trimmed. Leave ~1″ extra sashing at the top of the block for trimming. 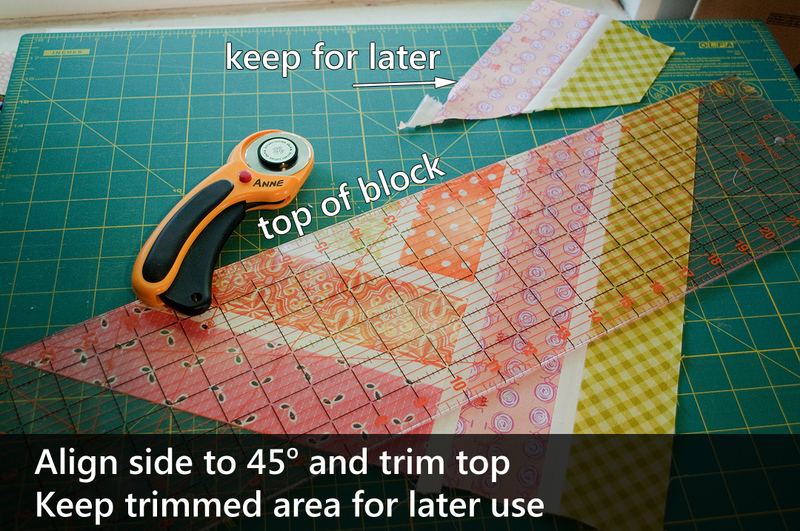 Add sashing to the right side which you just trimmed. 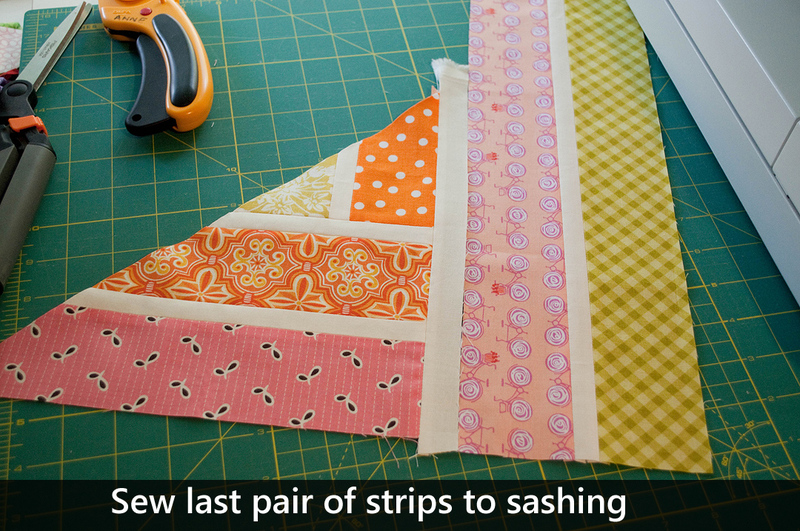 Next, sew your last pair of strips to the sashing you just added. Once again, I matched colors. Pink is currently the bottom color, so when I sewed the last pair of strips on, pink was on the top as shown below. Sew the last pair of strips to the sashing. 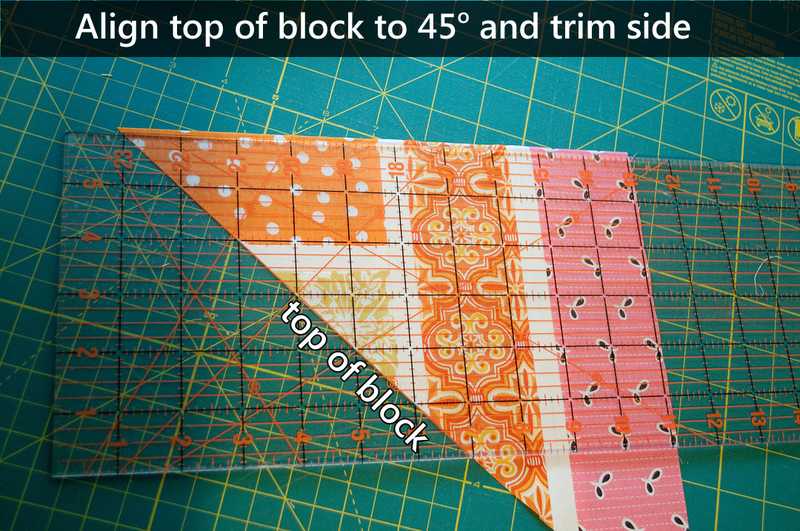 Trim the top of the block, using the 45 degree mark on your ruler. Once again, keep the section you trimmed off for later. Trim the top of the block, and save the remnants or later use. At this point, I like to start trimming the block down, just so I know where things are. 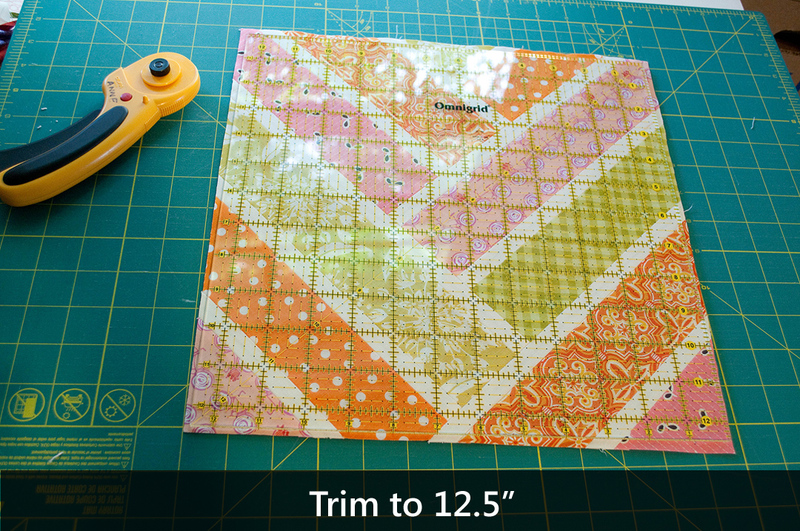 I trim to 13″ square and then trim down to 12.5″ at the very end so I can adjust for errors if necessary. 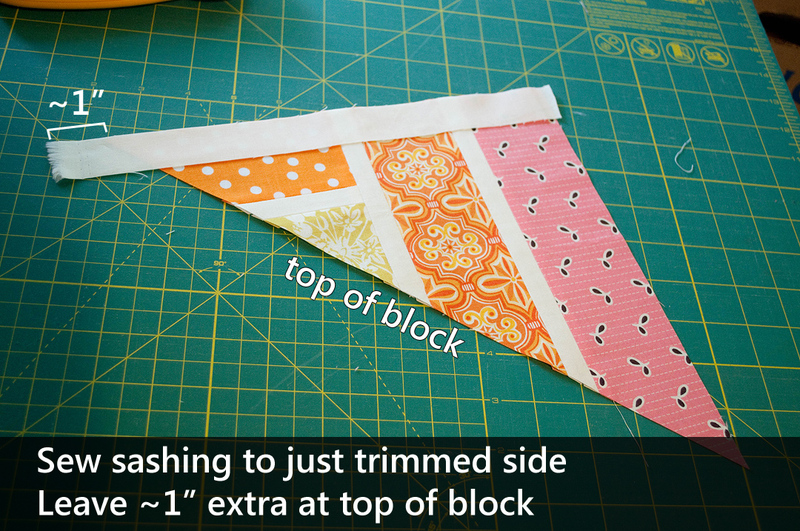 It’s also important that the triangle at the top is centered on the block so that you don’t end up with tiny pieces of fabric at your corners. So to center the block, I first line up the triangle at the 6.5″ mark on my mat (again because I’m trimming to 13″ first), and make sure the top is straight on the mat as well. Line up the center of the triangle at 6.5″ on your mat. Once the block is lined up, I trim the side of the block at the 13″ mark. You do not need to keep the part trimmed off. 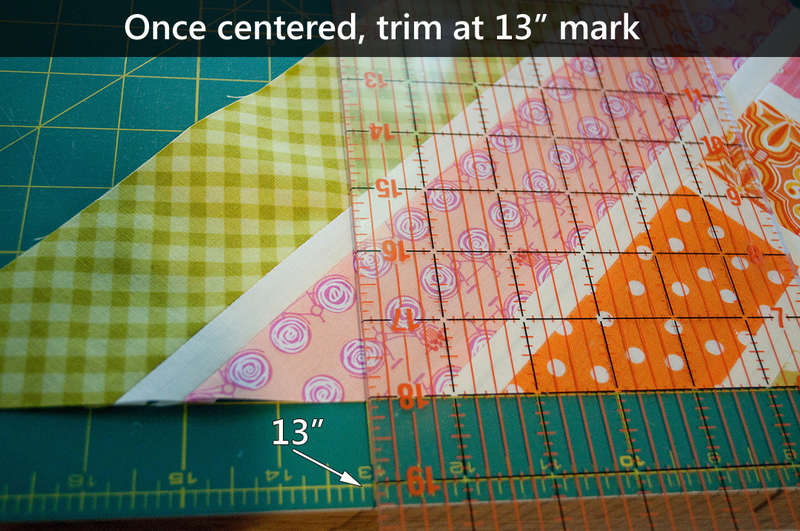 Then I flip the block, and trim the other side at 13″. At this point you can just line up the edges, the center will stay where it belongs. You don’t need to keep this piece either. Now that we’re trimmed up, it’s time to continue on. 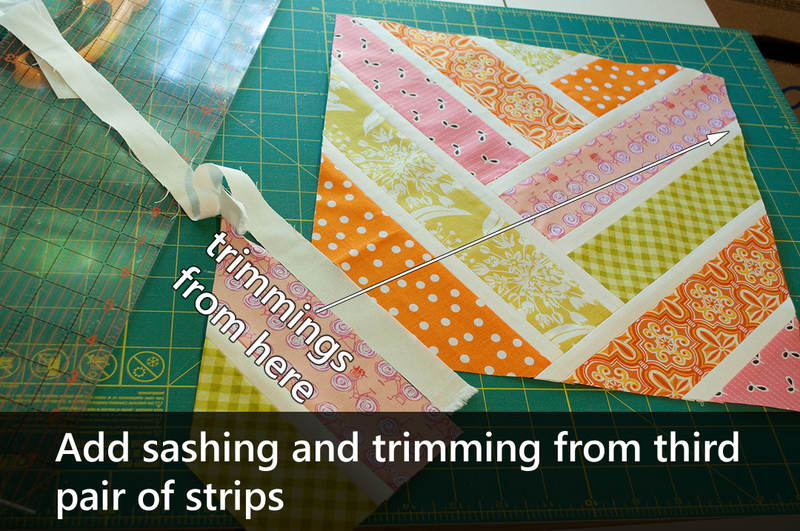 Add sashing to the angle on the left side and the leftover trimmed section from the first pair of strips you added. They should nicely line up because they were trimmed at an angle. Sew sashing and leftovers from the first pair of strips you used to left hand side. Press and trim both sides. Trim both sides of the section just added. 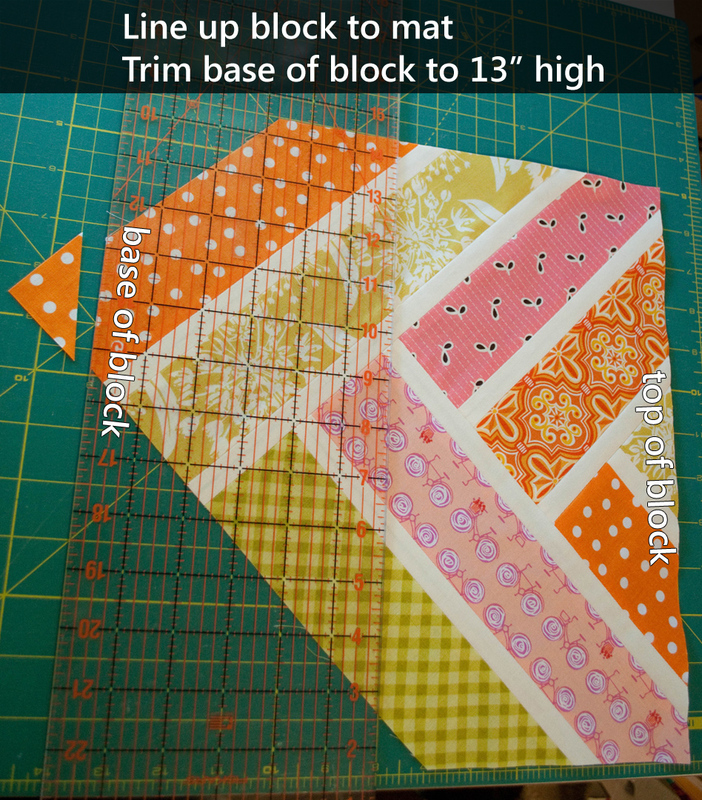 The block is now over 13″ tall, so trim the bottom so the block is 13″ tall. Only two sections left to add! Add sashing to the right side, and sew the leftover trimmed section from the second set of strips added to the sashing. Add sashing and the leftovers from the second pair of strips to the right hand side. Trim the right side and bottom of the block. Trim the side and bottom of the block. Next, add sashing and the leftover trimmed section from the third pair of strips to the lower left side of the block. Add sashing and the last set of trimmed section to the lower left side of the block. Trim the section just added. Finally, trim the block down to 12.5″, and you’re done! Trim to 12.5″ and done! 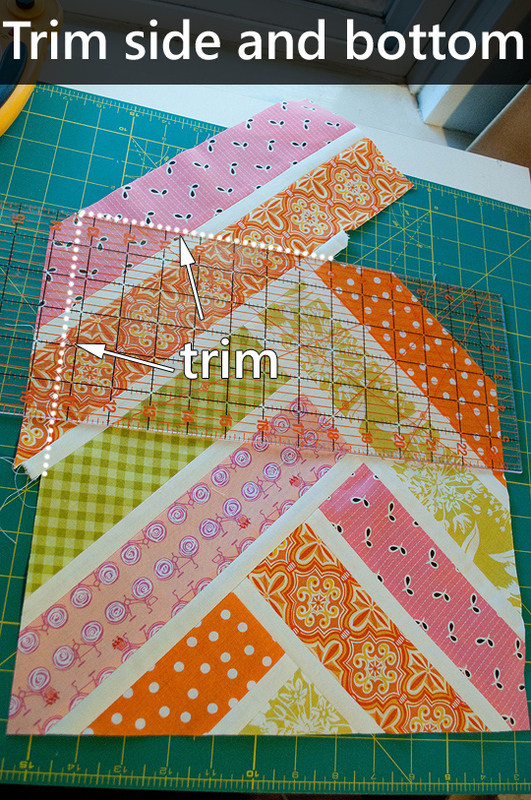 The reason I trim to 13″ first is because sometimes those bottom corners do not cooperate nicely. This happened about half the time, but I would just trim them off at the last step. Here’s a picture of what can sometimes happen. If it does, don’t worry, just work to trim it off when you trim down to 12.5″ at the end. And that’s it! 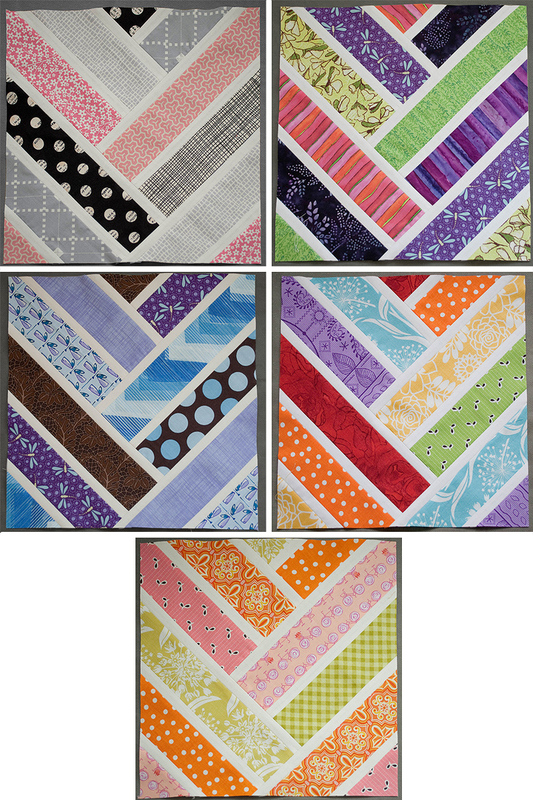 Here are a sample of the blocks in various colors. If you are interested in doing the rainbow version, I used red/orange, yellow/green, blue/violet as the pairs of strips. If you make this block, please share it in our flickr group! We’d love to see it. 🙂 Also, if you find any errors or have any comments, please don’t hesitate to let us know!